Haul: Some things old, some things new, everything bought, one thing blue. This is, once again, an amalgam of casts that I’ve been buying over the months. In fact, three of these were bought in June, and the other two were bought today. I have not really been keeping up with Hot Wheels and Matchbox as a whole due to life stuff, but today I’d thought I’d treat myself, and wrap all this up into one summer haul. The ATS-V R from Hot Wheels stormed onto shelves in late 2017 and became a firm favorite amongst many. I loved the overall cast and detailing in particular, as well as the representation of a Cadillac race car, which is, as known by many, one of my favorite brands in existence. The original release was black with the real-life race livery, this one retains the livery but is finished in a bright red. Overall, this cast is still a firm favorite. The proportions are great and somewhat true to the genuine article, and while the wing is a bit wild, it’s at least genuine to what its trying to represent. However, I’ve got to say the black coloring on the original model just works so much better with this model and its styling. While a standard ATS-V would look great in a bright red, a lot of details in the tampo and the model itself seem to be lost in this rather plain color. If you managed to miss out on the original version of the ATS-V R and you’re looking for one to add to your collection, than this version will suffice. However, if you’ve got the other and are wondering if this one is worth it to double up with, I say pass it up. I mainly grabbed it because I try to have all the Cadillacs I can get. I hope that in the future they can release a better variant of this, I’d personally love a version in flat black like the original test version of the ATS-V R. Plus a standard ATS-V would be nice too, but beggars can’t be choosy. The Hot Wheels Mk2 has been with us for a long, long time. I remember having an original cast from the 1990s with “Fahrvergnügen” plastered on the side, a neat little thing for a kid of a German family. Luckily, the old gal is still with us today, gaining in popularity after the addition of the Volkswagen Golf R a few years back. This version, part of an “old and new” line, is a hit in my opinion. I decided to stay away from the bright orange variant that was released earlier last year, due to just how loud the paint was, especially compared to the chrome ten spokes it was fitted with, which seemed just tacky as a whole. This version is a slight retooling of that package, and much more well done, with a nice deep yellow color, Radwood-approved stripes, and smart-looking black wheels. All in all, I like this little Dub, and seeing as the Mk2 is my favorite variant of Golf, all I can say is “The more the merrier.” While it may not match the Matchbox Golf Country in my heart, it’s definitely a nice supplement for it. If I could have any new version of the Mk2 in the future, I’d like to see a return to a straight plain color variant, and maybe a retooling with some detail tampos wouldn’t hurt either. Unlike the others, I believe that this is the first release of a surprising new addition to the Hot Wheels line. I remember it like it was only yesterday that the 2015 Mustang GT model was released, and here we are getting a model for the refreshed 2018 Mustang already. But, Hot Wheels has always been eager about Mustang representation, so I shouldn’t complain. But I’m going to anyway, because for a first release of a new model, this is lacking severely. This particular variant looks just so cheap from afar, with its slightly appealing blue clashing with black tampos and wheels. It looks more like a cast re-release than a debut, especially with its lack of detailing tampos front and rear. It just seems way too plain, and I’m really not a fan of that. I think maybe with some brighter wheels and extra detailing, I would have fallen in love with this model, but as it stands it needs something more that Hot Wheels just isn’t giving it. Perhaps in the future they can rectify this, but as it stands, I’m very disappointed. When Matchbox unveiled the new Mercedes-Benz line full of new and classic Mercedes models, I kind of felt indifferent about it. Sure, the models chosen were quality picks, but only a few stuck out to me, and this GLE was one of them. The Matchbox GLE was released earlier this year in a nice black color, and it was a definite favorite for me. As one of very few who likes the GLE Coupe in general, I was happy to see just how well-done this Matchbox recreation was, and this special edition is no different. The cast itself remains unchanged from that original model, but what makes this edition so special to me is that gorgeous chocolate brown color. It matches so well with the dark grey lower cladding and really makes some of the finer details such as the lights and emblems really pop, just as the black did. I’m a sucker for a nice brown, and this one definitely gets the ticket. This little GLE is an absolute gem in my eyes, and a real firm reason as to why Matchbox is simply awesome: they do everyday cars so well. I can’t really think of any ways that this model could be enhanced, just keep the pretty colors and good detailing coming. If they could also squeeze out a retooling for an AMG variant, that’d be awesome as well, but I am definitely not complaining, not one bit. I like AMC, who doesn’t like AMC? I like it when aMC gets represented in smaller scale forms. So, in short, I like this Javelin very much. 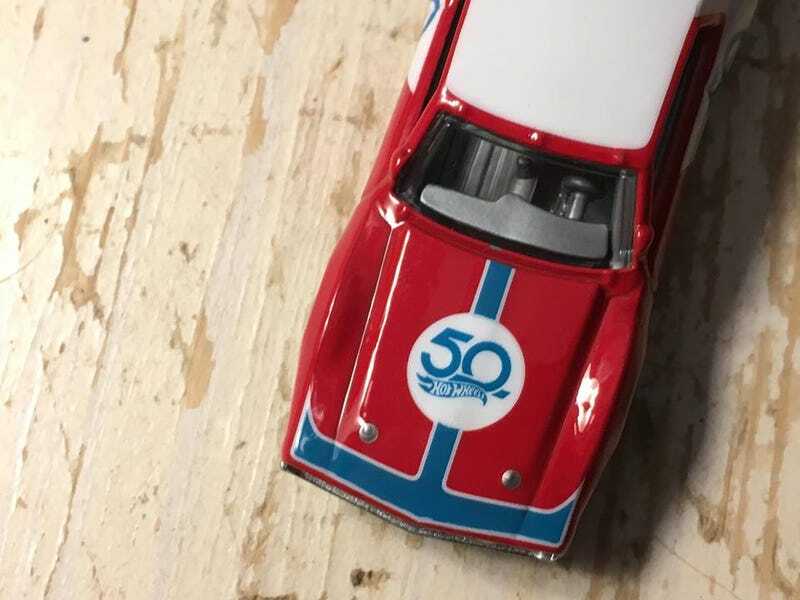 This is a representation of a very old cast, one that I haven’t seen in a very long time, brought to life for Hot Wheels’ own 50th Anniversary Favorites line, which looks back at the 50 years of Hot Wheels and their best of the best over the time. One look at this Javelin and you can understand why it’s a favorite. The period-correct colors and wheels just shine so brightly on a well-done cast. The Real Riders especially pop on here, and the tampo details all around are properly applied and add so much to it. It’s such a wonderful little replica of a legendary machine. I really hope that this return of the Javelin means that we might see a mainline redo later on, but if not, then I think this favorites variant makes up for it. It’s clearly the favorite (pun very intended) of this haul, and of my collection overall. If you can find one, grab it immediately, because I can’t imagine these will be on the pegs for long.